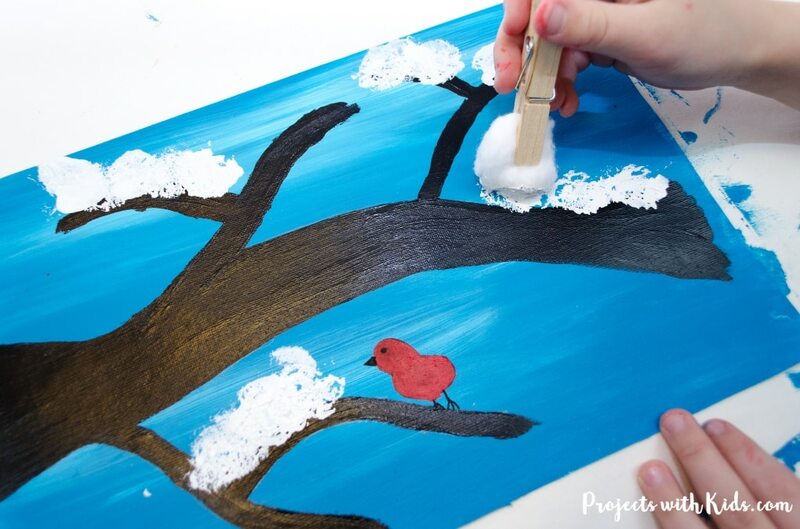 This winter tree painting with cotton balls is a fun and easy winter craft that kids of all ages can enjoy. I love the fluffy snow texture that the cotton balls create on the branches and the contrast of the black branch and white snow against the blue sky. 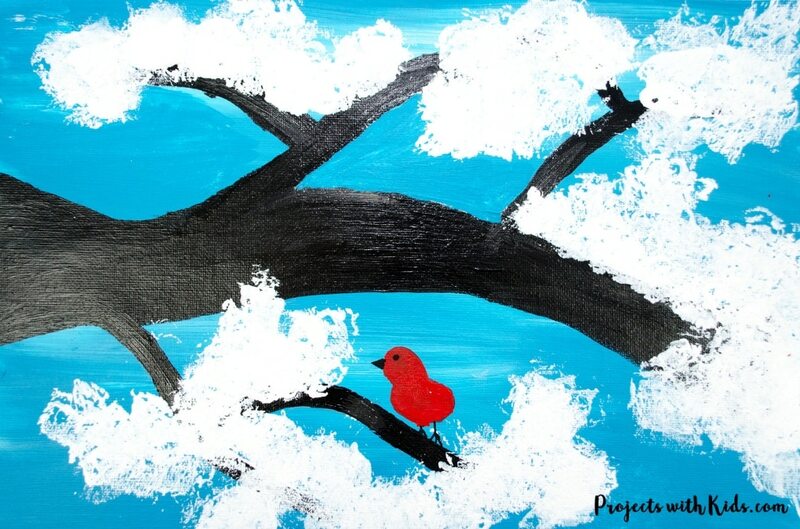 We also added a cute little fingerprint red bird for a pop of color. 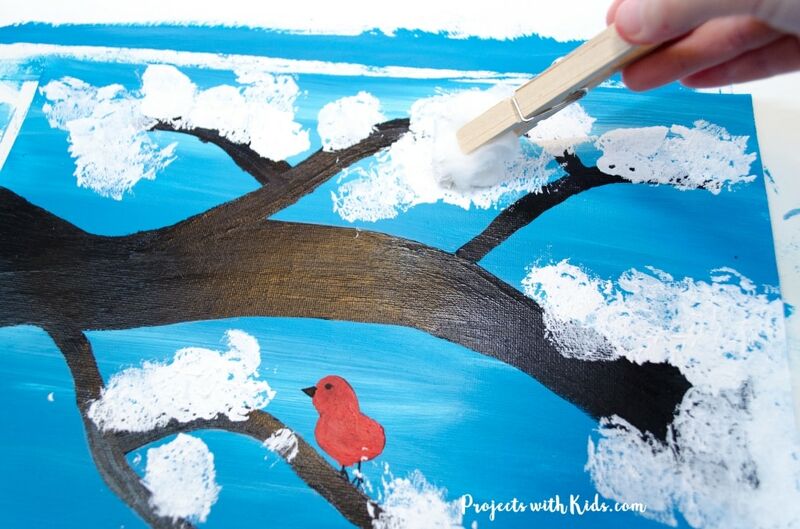 This winter project is the final cotton ball tree that we have done, there is a beautiful spring cherry blossom painting, a vibrant summer orange tree, and a gorgeous autumn tree all painted with cotton balls. 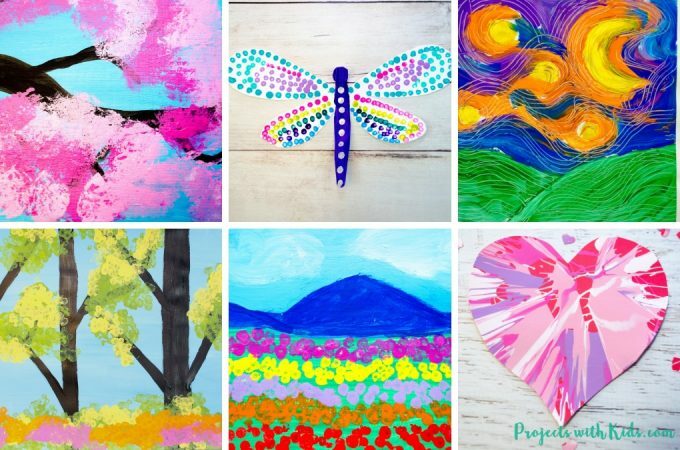 Cotton ball painting is a fun and unexpected technique for kids to explore. Both my kids love painting with cotton balls, it gives a nice fluffy texture which is perfect for creating leaves, blossoms and in this case fluffy white snow. I have created a printable branch template for you to use, that is perfect for younger kids and kids who would prefer not to draw their own branch. 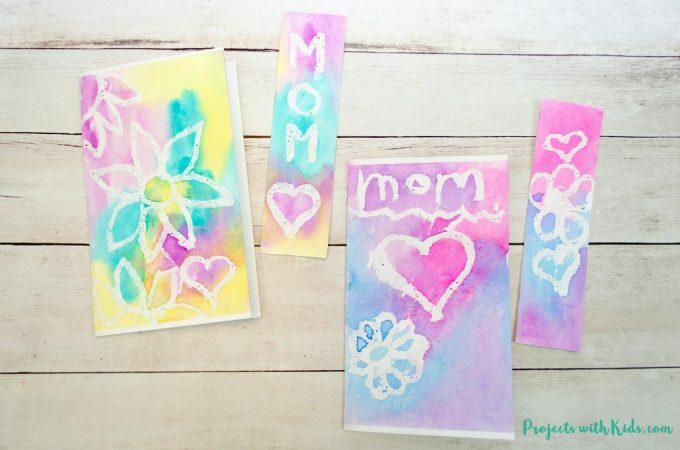 You can print it on cardstock and start painting right away. You can download this template as part of my free printable library. Sign up link is below. 1. First, you need to decide if you are going to draw out the branch or use my template. You can download your template below. We used a canvas paper for this project, cut in half to 12 x 8 inches, it works great and the colors turn out vibrant. 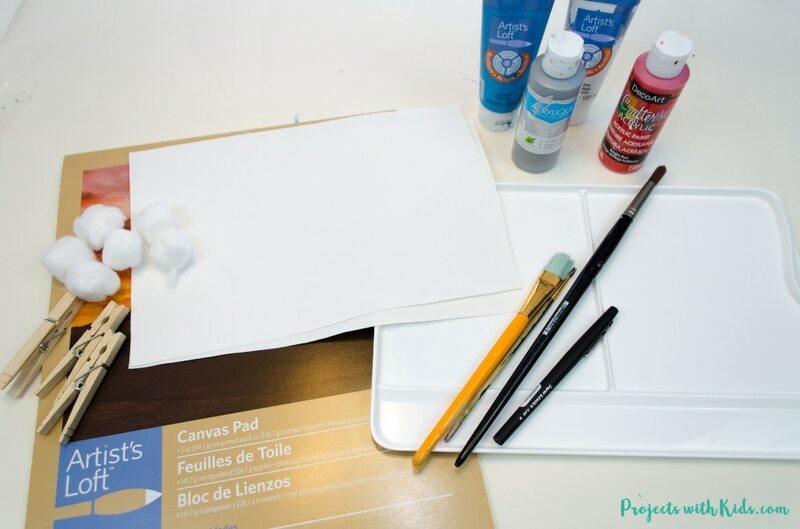 You can also use a canvas board or stretched canvas, anything will work. 2. Paint the background first, we used a nice vibrant blue and then mixed in some white for a bit of texture and interest. 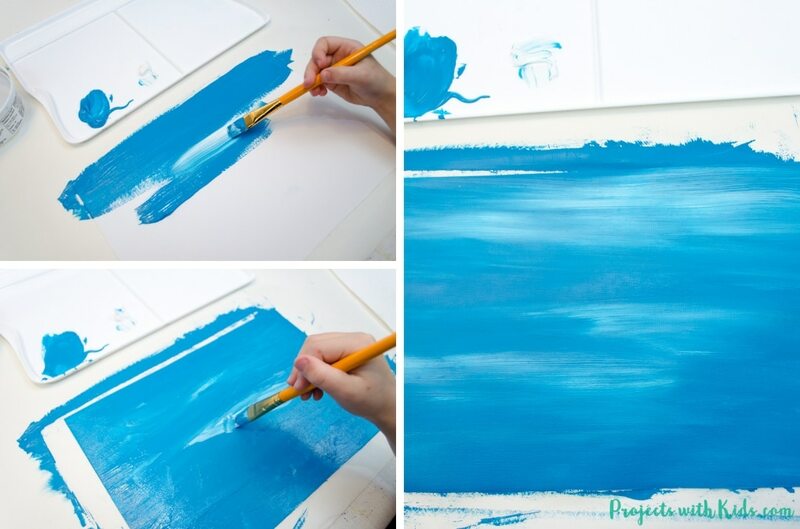 Using a larger brush to paint the background makes this easier for kids. 3. Once your sky is completely dry, draw in your branch. If you are using the printable you can just skip this step. Painting the background blue, should not cover up the branch outline. 4. Paint the branch black, I like to use a smaller brush for this step. 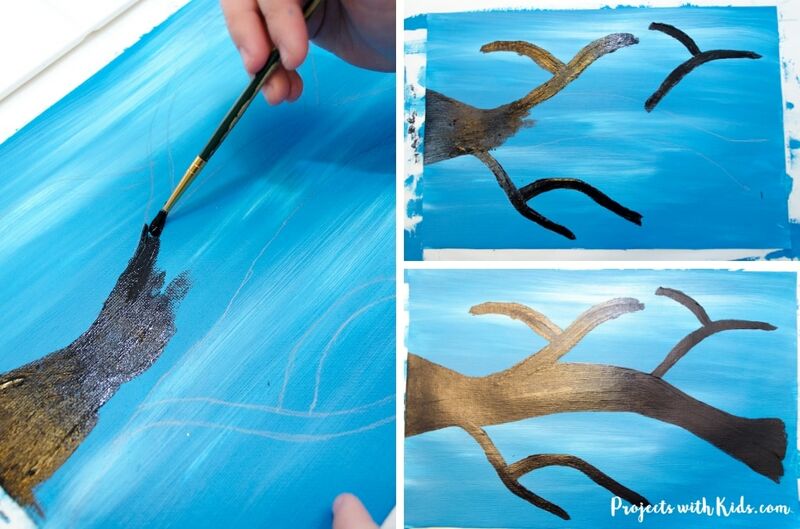 It makes it easier for kids to paint in the thinner branches and get better detail. Let your branch dry completely. 5. Next, it’s time to paint the cute little red bird. 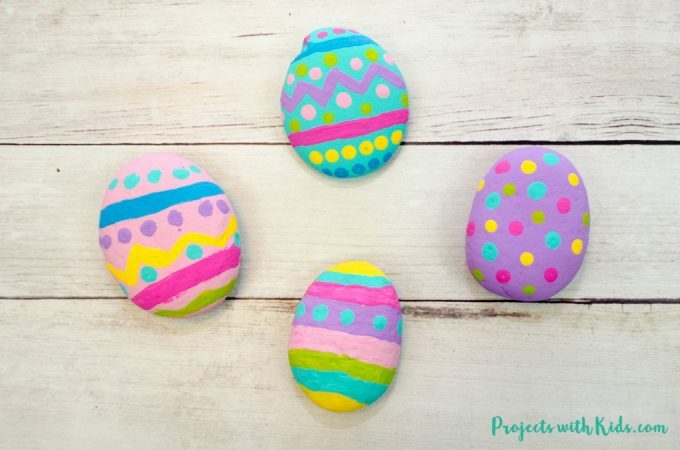 I love this fun pop of color and using the kid’s fingerprints makes it extra special. Kids can choose where they want their bird to go and use their thumbprint to make the bird’s head. Then they can use their first finger to make the bird’s body. 6. Let the bird completely dry and have kids draw in feet, a beak and an eye with a fine tip black paint pen or marker. 7. Now on to the snow! 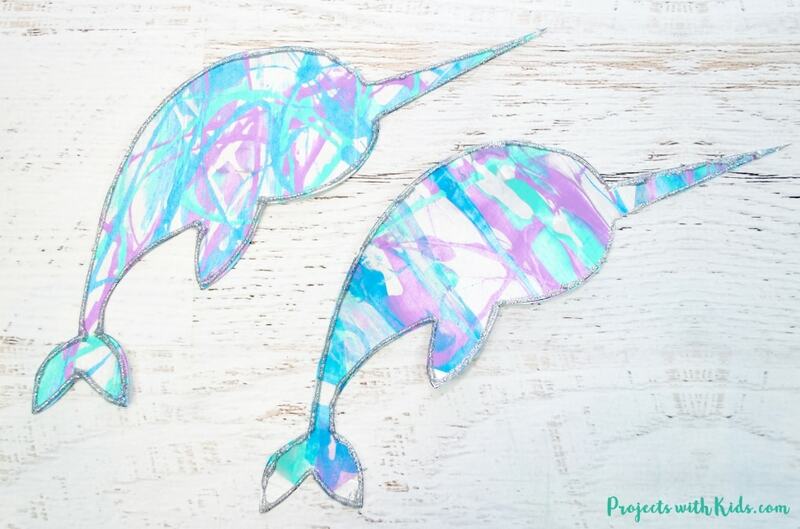 Kids can make their cotton ball paintbrushes with a clothespin and a cotton ball. 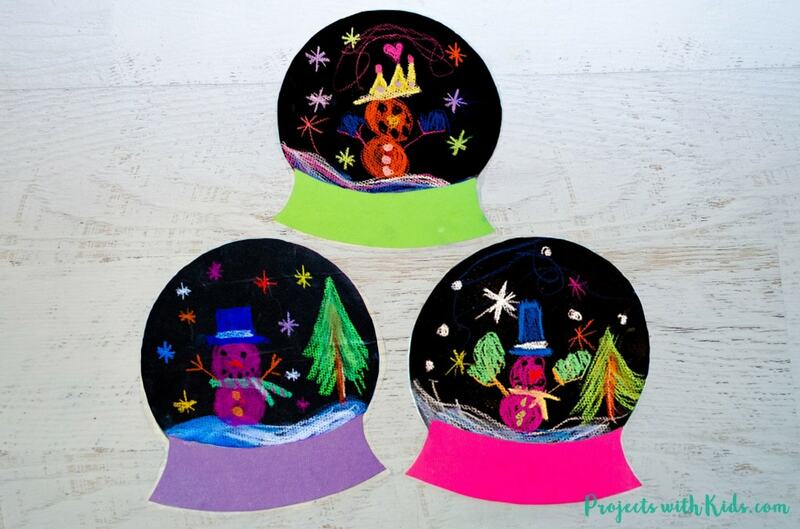 Dip the cotton ball into the white paint and create your snow. 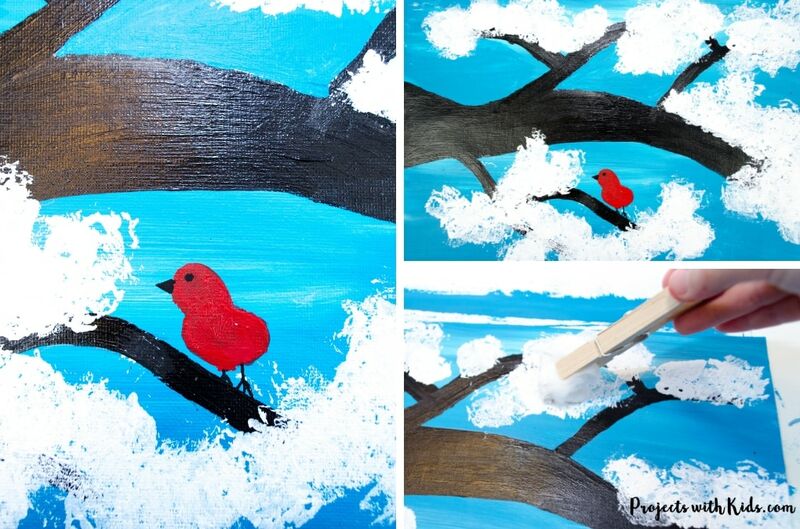 Kids will love this step and creating their snowy branch. 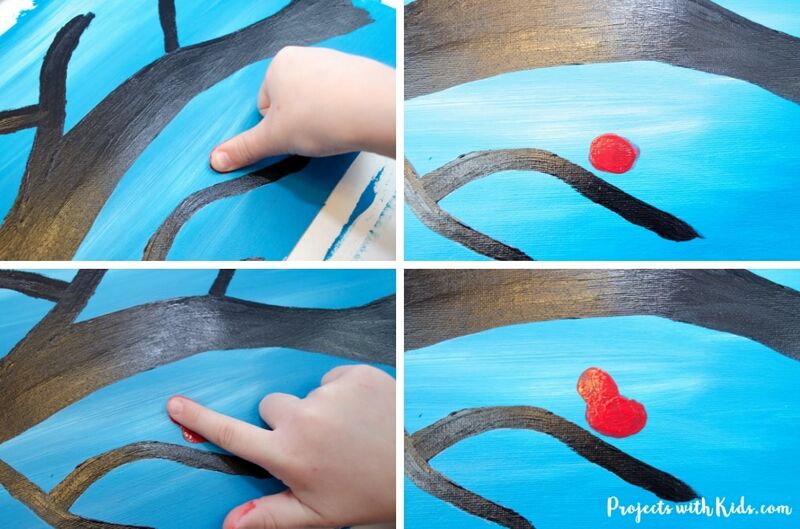 This winter tree painting is an easy winter craft that kids will love to create. 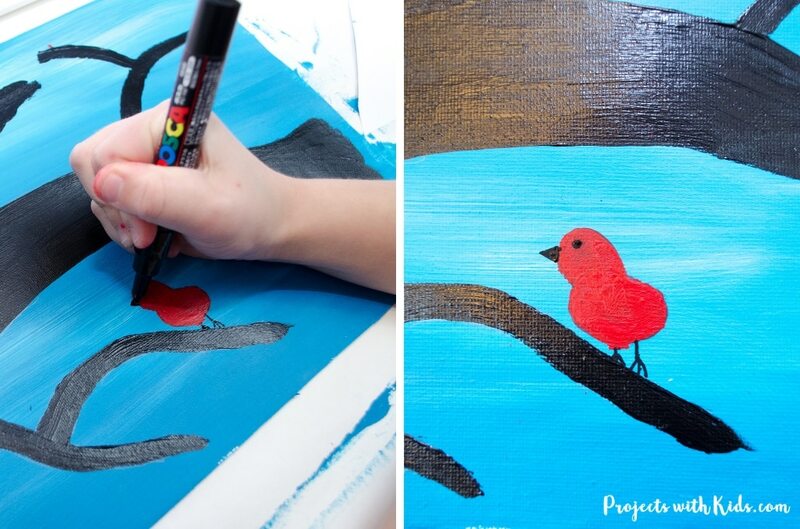 Painting with cotton balls is a fun process for kids to explore and using their fingerprints to make the red bird makes this painting extra special. 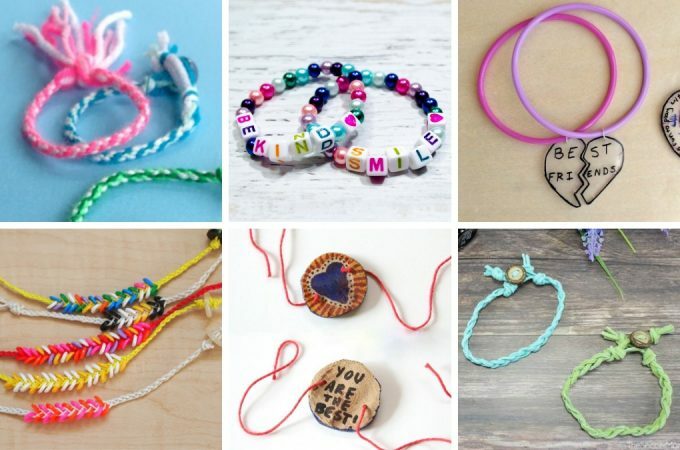 Click here to subscribe to my email newsletter and gain access to the free printable library. After confirming your email, you will receive a welcome email with all of the details.